In 2008, there was a vision to create a high-end hair salon with an upbeat atmosphere and city feel, to provide the best in hair styling and other beautification services to women – and gentlemen – who crave an upscale experience. The decor and product lines offered are particularly chosen to set the salon apart as an individual in the local beauty industry of Wilmington, North Carolina. The stylists are an eclectic mixture of high talent stemming from cities across the country, each bringing their own skill set and flare to the consistently beautiful hair that walks out of the door of Beauty Bar Boutique. The staff is dedicated to delivering top customer service that is friendly, personable and accommodating to each and every customer. We welcome you into our salon… Refresh yourself with an espresso, sparkling water, blooming tea or glass of vino. Flip through pages of Vanity Fair, Conde Nast or perhaps Garden & Gun. Awaken your senses with Oribe’s signature scent of edelweiss flower, watermelon & lychee extracts as your hair is nourished, enlightened and transformed. Pick up the season’s trending lip color or treat yourself to new nail & lip laquer by Smith&Cult (free of the 8 harsh chemicals!). Ease your getting ready time with Naturalash eyelash extensions. Let us paint in some sun-kissed brightness, or dimension-adding lowlights from our Wella color line. Fight the humidity and live a littler easier with a Keratin Complex blowout. Embrace a new style with a haircut that changes your view of yourself, and the world. Beauty Bar Boutique, a ladies & gent’s hair salon. Hannah Lynne's passion for the artistry of hair sparked suddenly & unexpectedly when she enrolled in beauty school by a friend's suggestion a week after college graduation. That spark and drive carried her passion to Manhattan where she studied and apprenticed color, cutting & styling at both Oscar Blandi and Cutler Salons. She has worked closely with owner Rodney Cutler, as well as multiple platform & editorial artists, allowing for experience with professional models & celebrity styling. She has been a part of styling for multiple editorial campaigns such as Vogue, Real Simple, and Rolling Stone magazines. Her work has been featured on national blogs & editorial features, and she continues to work with agencies in nyc. 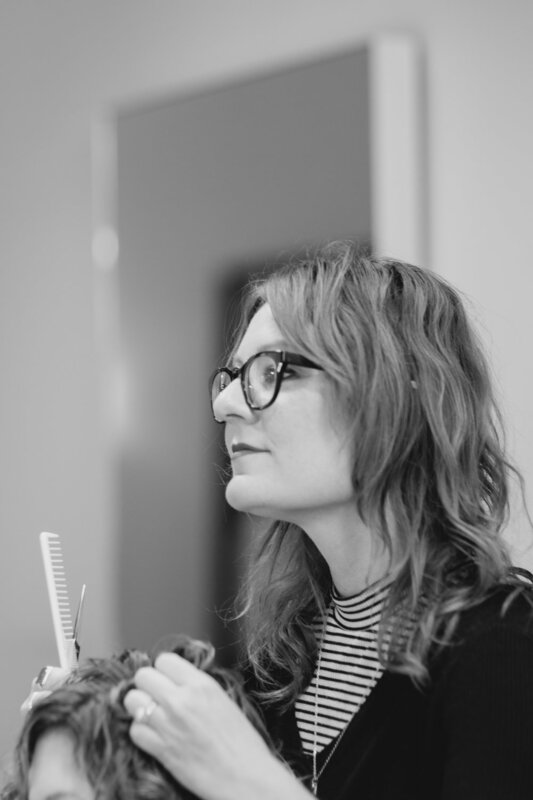 Hannah has worked over 14+ seasons as a member of hair teams for New York Fashion Week for designers such as Nicole Miller, Trina Turk, Cynthia Rowley, Tadashi Shoji, Zimmerman, Reem Acra, and over 70+ more! Most recently she styled for designer Rachel Antonoff’s catalogue featured on Vogue.com. She continues to travel back & forth, but loves calling Wilmington home! Working behind the chair with clients, she says: "I love to embrace client's natural textures encouraging them on how to modernize their style while educating on how to keep it healthy and beautiful." After earning her degree in Chemistry from UNCW, Ramsey decided to follow her passion and become a hairstylist. When clients ask Ramsey what her favorite part of hairstyling is, she answers, "ALL of it!" From hair cutting and styling, to the most challenging color corrections. Most importantly, she truly values each and every one of her clients and she educates her clients on the right products and styling techniques for their hair, using skills she has learned in various Oribe, R+Co, V76 by Vaughn, and Wella advanced education classes. She even has a few seasons working New York Fashion Week under her belt! Ramsey and her husband are now enjoying life with baby girl, Noa. Fun fact- Ramsey’s first car was a 1966 Mustang that she drove for eight years; she loves the classics! While Natalie may live on the east coast, she is still a California girl at heart, but loves calling Wilmington home! With a bachelor's degree in Interior Design under her belt, she first followed her artistic drive to a career in Las Vegas, which led to her discovery of another aspect of art in the form of hair styling. She now applies the same design fundamentals to her work in the salon excelling in both hair styling and make-up artistry. She loves a good makeover, and feels rewarded when her clients leave feeling great about his or her new look. She draws inspiration from film and foreign cultures, and especially enjoys event styling. And to back up all of her talents on paper, she has certifications and advanced training in brands such as Oribe, R+Co, V76, Wella, Babe Extensions, Keratin Complex and several others! Fun fact: She is slightly obsessed with all things Harry Potter! Thomas brings his talents all the way from Lexington, KY. A stylist since 2008, he always, "feels blessed to be in the hair business," and doesn’t take a day for granted, similarly to the way he thinks no client deserves the same look. With each guest, he likes to carefully create a style and a regimen, that they can recreate with ease. He truly cares and takes pride on making his clients look and feel their best. Thomas is our in-house color guru, and is a Brand Educator for Wella Professionals. When he’s not in the salon creating magic, he’s typically traveling across the country teaching other stylists the newest hair color trends, inspirations, and professionalism in the industry as a whole. Being a workaholic, he relaxes by playing sports and listening to music. Basketball is his love, with golf coming in at close second. He says music, "is a part of my survival; I always have my headphones on." FUN FACT: Being a normal guy, if the hair industry had not chosen me, I probably would of chosen to be a lumberjack, or any job that deals with being in the outdoors! Kelsie is our native Wilmingtonian! She grew up coastal and loves calling it her home. She is very excited to be launching into her career, and has experienced advanced training in Miami & NYC by Oribe and Wella educators. Kelsie first discovered her love for the hair industry while at her first job as a party coordinator where she fell in love with styling. She has found a passion in hair painting techniques such as balayage and color melting, but has definitely fallen in love with ALL the components of the hair industry. One of her favorite things about doing hair is being able to bring out her clients' confidence and seeing them love their new look! Her goal is to build a personal relationship with each and every client that comes her way. Fun fact: On her days off she's taking her English Bulldog, Koda, on their next adventure! Ali is exquisitely and naturally talented in both hair and makeup services. She has innate passion for the beauty industry, and her customer service will impress any client with her ability to give each guest custom looks, leaving them feeling incredible! Her current passion is the deconstructed "lob" which she customizes for each guest! Ali is equally passionate in both cutting& color, but doesn't really solely on her natural talents. She is constantly pursuing education by taking advanced level training through Oribe, R+Co and Wella national education. Fun fact: Ali is a Kilwin's salted caramel apple addict. Lauren began her career early on, and was initially inspired to pursue her career in hair, when she was modeling for local editorials and fashion shows! Lauren has thrown herself into finessing the details and growing in all aspects of the artistry of hair design. Her passion is for people, and every guest will feel valued and cared for in her chair. Though, she is a very talented, well-rounded stylist, her main passion is haircutting and styling! She loves natural textured hair and showing you how to love your hair. She has received training in Miami, Atlanta, and many other cities on razor cutting and editorial styling. You do not understand the words "positive" or "joy-filled" until you have met Hali! Passionate about people, about life, and most definitely about all things hair. Her ability to authentically connect with each client allows her to understand individual needs, to be able to produce a beautiful outcome that makes both her and you (as a client) incredibly happy! Hali has been through advanced haircutting + hair color + styling training not only in an intensive in-house training program (like a graduate school for hair stylists), but also through world class brands: Oribe + Wella + R&Co. Fun fact: Though she is petite and chic, this little lady loves afternoon cruises on her motorcycle! Born with a passion for all avenues of beauty, Maari's decision for a career in the beauty/aesthetic field was very clear. After moving across the country from Alaska and earning her bachelors degree in psychology, she decided to pursue her first love, makeup! Initial training began in a tv/film make-up course, then led to pursuing a licensure in Esthetics, following her certification in Naturalash Eyelash Extensions. Maari is our in-house lash extension specialist and make-up artist. With an eye for detail and constant pursuit of perfection in all aspects of beauty, she finds great joy in creating beautiful make-up looks and gorgeous lash extensions to suit each person’s desires! Fun fact: I grew up working on my family's commercial fishing boat with my parents and five older sisters. SUGARING!! Jenny has brought sugaring: an all-natural hair removal service to Wilmington and to b3! She comes to us from Minnesota, where she grew her customer base and experience in this natural service offering. She is incredibly passionate to launch this service in our area and educate clients on the MANY benefits for skin sensitivity + radiance + long term effects! 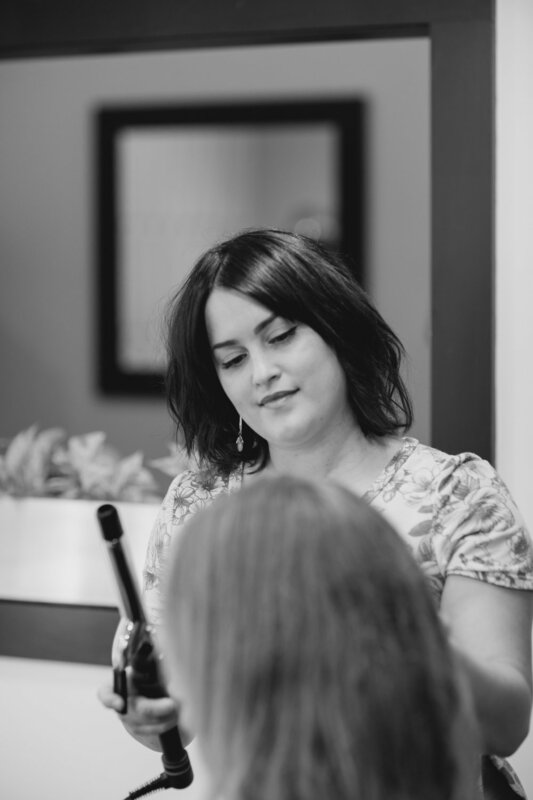 Jenny not only has experience in sugaring and is trained through the Alexandria brand, but also has her Bachelor of Arts + BS in Mass Communications! Jenny is also being groomed in lash extensions under Maari, our in-house expert, and will be offering lash extensions come Spring 2019! Fun fact: She collects the Starbucks “where are you” coffee mug collection and has over 20..aka she travels a lot :)!! *see the Stylist Training tab for more info on receiving excellent & lower cost hair services as part of our in-house training program! For information on our wedding services, please fill out the form on our WEDDINGS tab above!